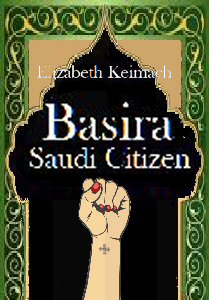 Basira is a Saudi citizen. She visits her half sister Joy for an extended visit. Joy is half British and lives in Scotland. 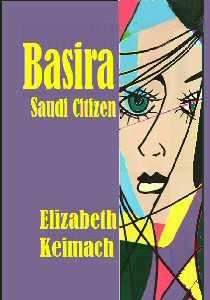 Basira meets an Arabic speaking Copt Christian there and eventually decides to follow his religion. She moves to Egypt with him but when her father dies she decides to return to Saudi for his funeral. 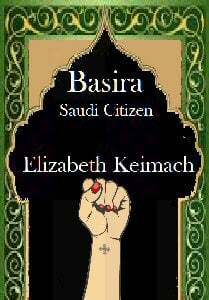 If the Saudi religious police find out that she is now a Christian she will be accused of apostasy and if she does not retract she will be killed. Basira's story is the third in my “Stolen” series. Very nice artwork! As usual, the first thing I would suggest is to lose the border. It really contributes nothing to the effectiveness of the cover. On the contrary, it distracts and it reduces the relative size of the other, more important, elements. So...for starters, remove the border and increase the size of the illustration. We we can talk about the rest of the design after that, but I might make the suggestion now that you make the text—the title, subtitle and your name—either all flush left or right (the latter would, I think, work best with the cover layout since it would tie the type with the illustration). The indented subtitle doesn’t look right. It’s not really necessary to leave so much room for trim. The best thing is to simply keep anything important away from the edges. A quarter of an inch is more than enough. Yes, you may lose a little of the illustration, but nothing really important. Any border like the one you are using is simply distracting no matter how much winds up actually showing. I have done a very large number of book covers for both traditional print and POD and have never had to resort to including a border to allow for trim. You cover design will infinitely better and more professional without one. Thanks, I'll have a go! Also, unlike my 2 previous books in the series I'm trying more "showing" and less "telling." If I develop the skill I'll revise the other 2. 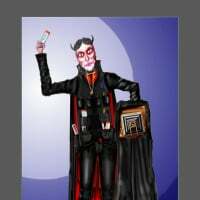 Skoob was helpful in his comments and he "practices what he preaches" in his books. Like Liz, I learned to keep the main image away from the edges to stop bits getting trimmed off. At times I use a border, but it usually extends to the spine and back cover, so it is really a background. I don't see how it detracts from what is important, unless the border is huge and the text small. But, Ron is right about that border. It's the colour makes it very distracting. The simplest cure for it is to make it the same purple you have the text on. I am not keen on the yellow text on purple, though. The text is a bit unbalanced also. Your name needs moving down a bit so the gap from the bottom is the same as the gap above the title. Perhaps make the text larger? They are not centralised, either. Picasso would be proud of the image. But is it relevant? BTW. There's a light purple line between the purple and the image, should there be? PS: that's not the actual resolution is it? Because it is breaking up in to blurred pixels. Thanks both. She's caught in a spider's web Kevin. I thought that as yellow and purple are complementary colours it might work. I'll draw a more realistic woman caught in a web and see what that looks like and on the other I'll get rid of the border and try what Ron suggested. Well it's all indoor work on the computer. Hours outside with my easel and paints, or sketching with pad and pencil, are over! I made the cover 300dpi Kevin. I made the border in a clashing colour to show the clashes between the women striving for freedom and the religious police and Sharia law. If you don’t see it, then it’s probably impossible to explain how and why making the image smaller than the full size of the cover then surrounding it in black or some other color makes it less effective. If nothing else, it looks like a page from someone’s family album. Sure, if you are hanging it on a wall. Both of these are great improvements! The second is probably by far the best since it does a better job of suggesting something of what the book might be about. And by being less static than the first cover, it is more involving. The bullseye effect of the web draws attention to the woman, and the eye as the focus naturally attracts the casual gaze. The web effect also has a subtle resemblance to shattered glass, which heightens the sense of tension and drama. My main suggestion would be to rethink the choice of typeface. First of all, the one you used is used far too often. You probably also want something simpler with such a busy background. This is not too bad with the title, but it makes the subtitle and your name much too hard to read. And while you are at it, move the subtitle away from your name and closer to the title. Right now it seems to suggest that you are a Saudi citizen. Yes, I wanted to suggest that as she has become a Christian she is not wearing the headscarf anymore and lets her hair free. Maybe I can put her in a coloured abaya and headscarf as she does return to Saudi for her father's funeral. In some places, like Jeddah, women can wear coloured abayas. The only problem is her father lives in Riyadh where women must wear black abayas and headscarves. I think that will cause too much black. Maybe I can make the web white? (The enclosing cloak) I take your point about the font. Thanks Ron I'll have another go later. Do you like the white colour for the font? PS I am in our local library and I asked the librarian and the library assistant which they preferred and they both said the first.They said it was more striking and a cleaner cover. I think I will tidy the second one up a bit. Yes, I wanted to suggest that as she has become a Christian she is not wearing the headscarf anymore and lets her hair free. To understand that would really require some preknowledge of the book on the part of the potential reader...which they would not have. Maybe I can put her in a coloured abaya and headscarf as she does return to Saudi for her father's funeral. In some places, like Jeddah, women can wear coloured abayas. The only problem is her father lives in Riyadh where women must wear black abayas and headscarves. Ditto what I said above. It’s easy sometimes to forget that your potential reader is not as familiar with your story as you are. I know it can be hard for an author to be objective about their own work, so you always have to be careful to not make it necessary to have read the book to understand or appreciate the cover. Getting the idea of the book across is the main thing. If, for instance, it is important to convey your heroine’s conversion you need to get that idea across pretty explicitly. Using symbolic colors may be much too subtle. A cover needs to get the basic idea of a book’s nature or theme across with some immediacy and clarity. It can be filled with incidental details that relate to specific events in the story but those would be secondary. Had another go, still not right! Keep at it! Even a professional, working for a traditional publisher, can take several tries to zero in on exactly what is needed. Thanks both. She's caught in a spider's web Kevin. Ah, that's not what I thought. 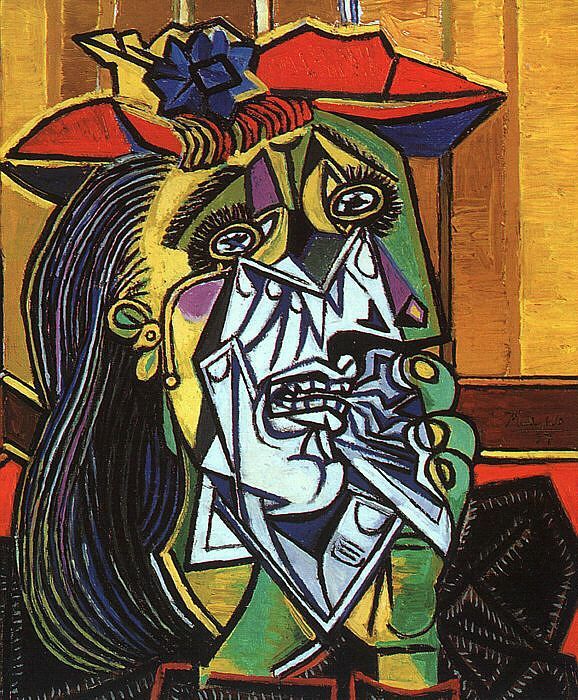 It really does look like a Picasso. I thought that as yellow and purple are complementary colours it might work. No! It's fine, leave it at that. But if you like try to make it so that the lines of the web are not actually literally dissecting the face. and on the other I'll get rid of the border and try what Ron suggested. Indeed, that's a matter of choice. Well it's all indoor work on the computer. Hours outside with my easel and paints, or sketching with pad and pencil, are over! I made the cover 300dpi Kevin. 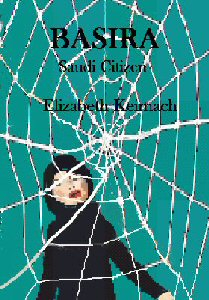 I made the border in a clashing colour to show the clashes between the women striving for freedom and the religious police and Sharia law. Sorry, only you know why you did it that colour, it cannot be guessed. than the full size of the cover then surrounding it in black or some other color makes it less effective. Well, as I said, where possible the edge matches the main background colour of the image, and it is the same colour as the spine and back cover, so it's not exactly just a border. One problem with covers on line is if a lot of white is used on a them, because the thumbnails are on a white background, or even all white covers, it can just look like text on nothing, so a border can help to show the edge of the cover. In your opinion. 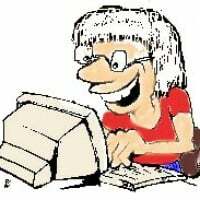 Interesting people if so, seeing that I write SF. Both of these are great improvements! The text now looks as if it's crammed to the side. The second is probably by far the best since it does a better job of suggesting something of what the book might be about. I am so sorry, but I think that one is an absolute mess. the web now looks like brambles. And by being less static than the first cover, it is more involving. The bullseye effect of the web draws attention to the woman, and the eye as the focus naturally attracts the casual gaze. The web effect also has a subtle resemblance to shattered glass, which heightens the sense of tension and drama. I will say nothing more about that. Indeed. A solid font would be better. Indeed, some do. 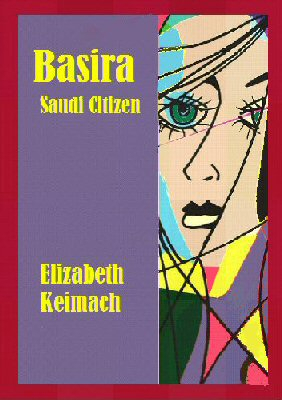 But since it might be a good idea to have the woman on the cover read immediately as a Saudi to the potential reader, you probably don’t want to illustrate her by using an exception. It doesn’t matter. Any amount smaller has an impact. You have a color frame surrounding the entirety of the cover art. That is a border. The spine can pick up a color theme from the cover without having to include that color as a solid frame around the art. I have no idea what that last sentence is trying to say. 2 more Any feedback welcome, THANKS. What would be a better colour for the text? or font? The first example is really, really nice! I think that anyone looking at it would immediately get some idea of the nature or theme of the book. Great job! Probably the only thing I might suggest doing is playing around a little with the position of the type. Right now, the fist is emphasizing your name more than the title. I would make the title much larger and move your name elsewhere . The Coptic cross is a nice touch, but I would not count on every potential reader recognizing it for what it is or its significance in the story. Keep it in, though. The second cover was probably better in its original version. The ambiguity of the web/shattered glass effect was nice, the scale of the web was much simpler and the size of the woman was also better. If you were to replace, for instance, the woman in the original cover with the woman from the second version---making her a little larger and including a little less of her body---that would be good. The type is a real problem, though. A decorative typeface like Algerian set against a busy background just makes it harder to read. Exacerbating this is the fact that the type is black against a dark, low-key color. Thanks Ron, I'll have a go tomorrow. Yes, the positioning of the fist seems as though it's going to punch Elizabeth Keimach. I'll change it. Of these two, I liked the top one better, especially the hair. It has a fifties/sixties retro look to the design, and the hint of cubism is a bit of a throwback. Also, the font face in the first is better. Granted, I have an affinity for old books, so I may not be the best judge. In the second, the hair seems a bit of a distracting element. In the first, we might believe that her hair is in a Western or a Saudi style (i.e. Hijab), but in the second it is definitely Western. But with the hair perhaps darker and perhaps the whole look given more definition, I can see where the second might work well also. It is a symbol related to exactly the sort of struggle that you are portraying in the book. * Arabic speakers will immediately "get it" though Western readers might not immediately. 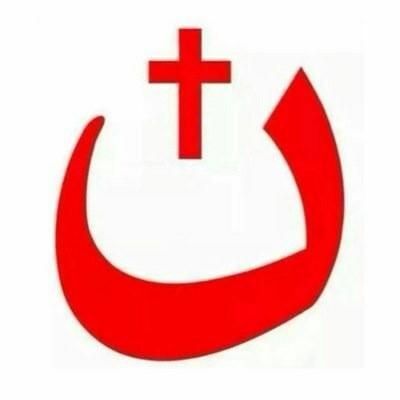 * The Arabic letter "N" is often tattooed on the arms or marked on the houses of Christians living in Arab communities. 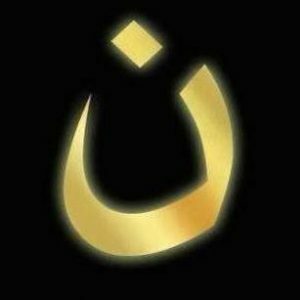 It marks them as "Nasrani," followers of the "Nazarene." I do miss the old coloured text options, I am no longer sure what I am replying to here! Is that not just an opinion? But I like it that way. That's the simplest answer. Most, if not all of my covers, do indeed show the people, or main person, in the stories. I also like the new first one. I am not at all keen on the very thick spider's web on the second one. It really is too thick. I assume it's also only symbolic? Although I preferred the first original one. The arm? Have you thought of actually using a photo of a real arm? I think the consensus is the fist with a few alterations . I thank you all. Now I can get on with finishing the novel.